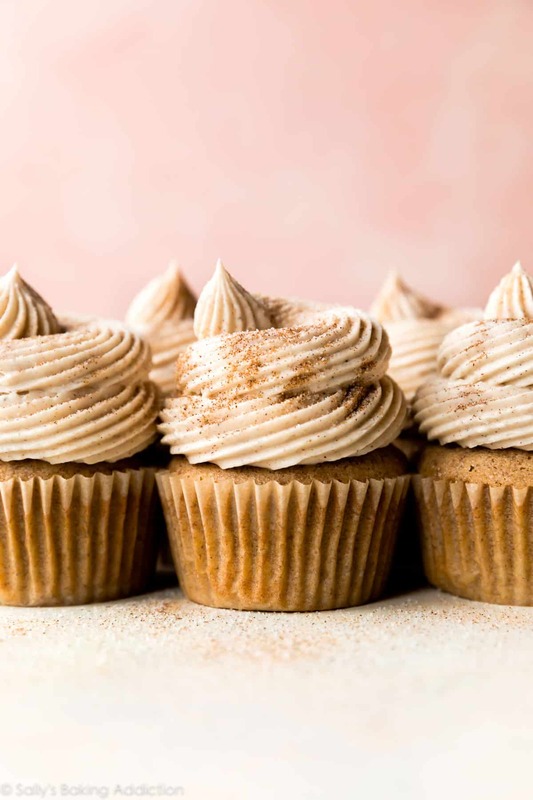 Adapted from my vanilla cupcakes, these chai latte cupcakes combine deliciously warm chai spices like cinnamon, cardamom, and ginger with soft and fluffy cupcakes. Top with my chai spice buttercream for the ultimate coffeehouse-inspired treat. Let me take a moment to thank you so much for all the birthday wishes for my daughter, Noelle! ♥ Between the birthday party, family visiting, a special birthday cake, some quiet family time, and all the thoughtful wishes from you– this was truly one of the best weekends ever. We felt the love surround us as we celebrated our daughter’s 1st birthday. Mom may have gotten super emotional on the night of her birthday as I read her On the Night You Were Born, but I suppose that’s expected when your baby turns 1!!!! I made all the birthday desserts for her safari themed birthday party, including her 1st birthday cake. Instead, my favorite fancy coffeehouse beverage is a warm chai latte. When brainstorming recipes recently, I turned to the very beverage I was sipping at that moment. And in the swarm of pumpkin spice flavored everything, I feel like you’ll appreciate this fall beverage inspired cupcake as much as I do! 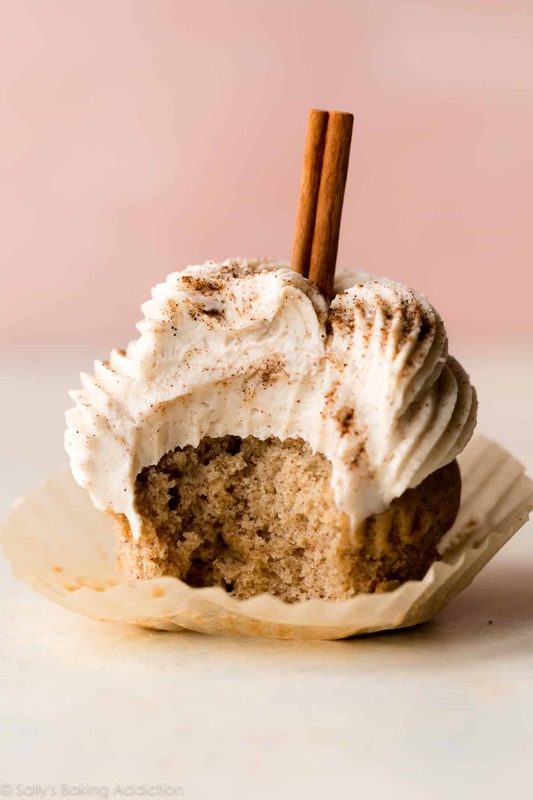 Between the chai spice buttercream and intensely spiced chai cupcakes, this dessert pushes all other fall flavored desserts to the back of the line. Pumpkin who? 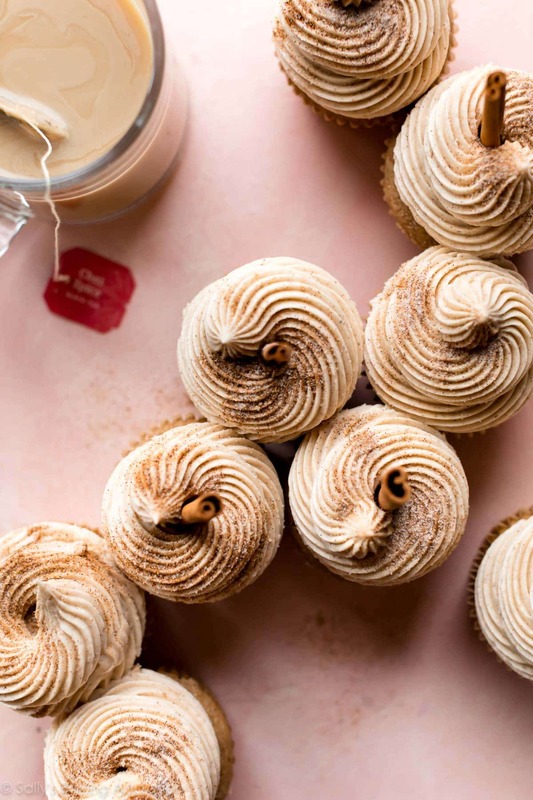 There are 3 parts to these chai latte cupcakes. Homemade chai spice mix – a blend of 4 simple kitchen spices makes the delicious chai spice flavor you love. Grab some cinnamon, cardamom, ginger, and allspice. This chai spice mix will be used in both the cupcake batter and buttercream, as well as the garnish on top. 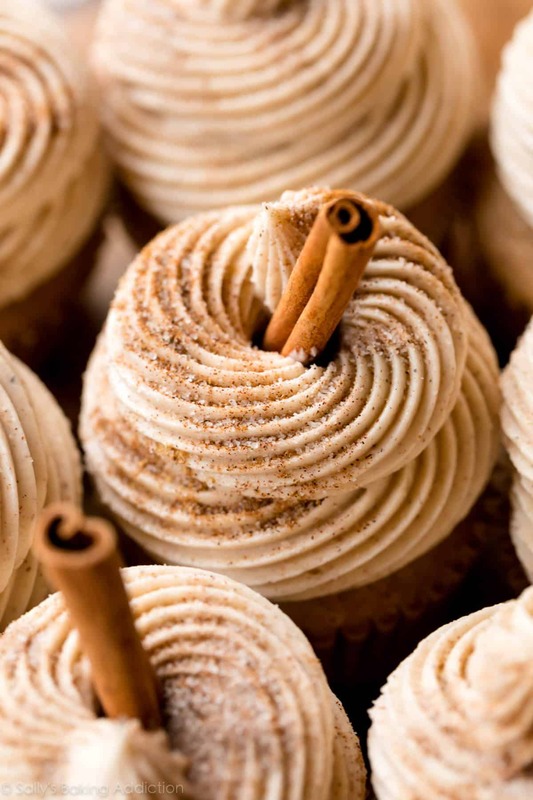 Chai infused cupcakes – we’ll use my basic vanilla cupcakes as the base, adding a generous amount of our chai spice mix. Instead of regular milk, we’ll use chai tea milk made from a bag of chai tea steeped in 1/2 cup warm whole milk. This concentrated amount of chai flavor turns our spiced cupcake batter into actual chai cupcake batter. It’s the secret sauce. Let the milk cool before adding to the batter. Steep it the night before to save time. Chai spice buttercream – richly flavored vanilla buttercream spiced with our homemade chai spice mix. It’s unbelievable how much flavor dry spices can add to our frosting! First, here is our chai tea milk that we’ll use in the cupcake batter. This stuff is potent! 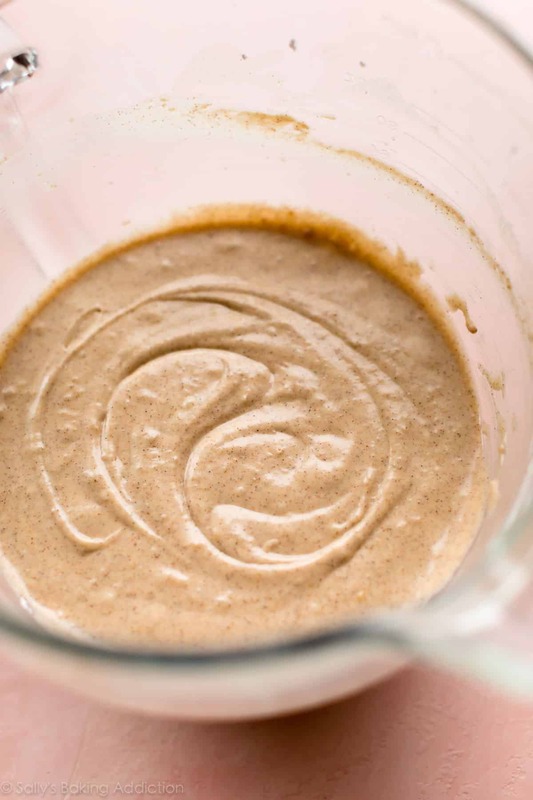 Because of the chai tea milk and chai spices, the chai cupcake batter is a beautiful shade of caramel. Curious about the other ingredients in the cupcake batter? Here’s a run-down of the vanilla cupcake recipe explaining why cake flour, sour cream, and egg whites are KEY to their soft, fluffy, and moist texture. 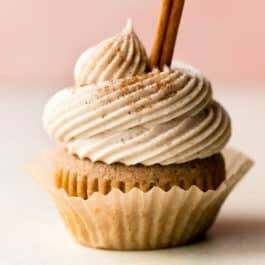 And here is why some recipes, like these chai latte cupcakes, call for both baking soda and baking powder! Tip: Fill the cupcake liners only about 2/3 full to avoid overflowing. Remember when I said rainbow chip frosting is the best frosting in the world? Lies. 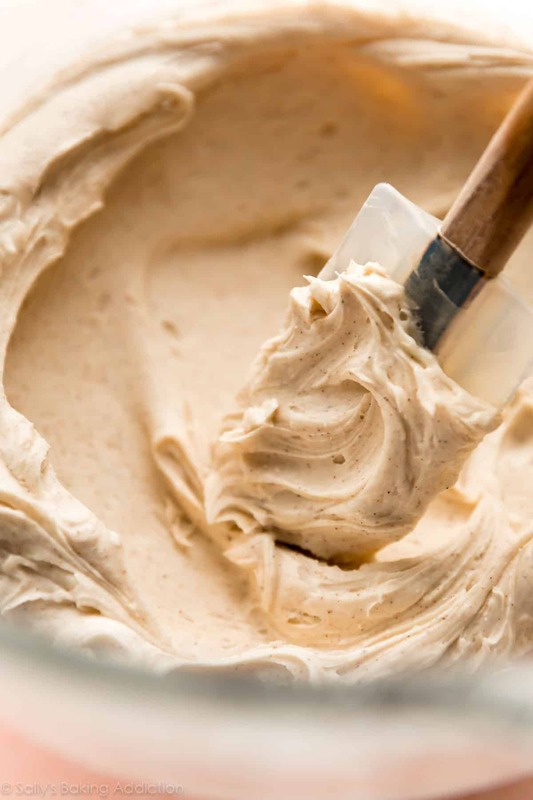 This chai spice buttercream, in all its silky smooth and spiced glory, sits at the top of the frosting world. Look how creamy! How I decorated these chai latte cupcakes: I’m having a Wilton 8B piping tip moment. Remember my white chocolate strawberry cupcakes and lemon buttercream photos? I LOVE this piping tip. Start in the center of the cupcake and swirl upward. You can watch me use it in this frosting tutorial video (:38 second mark). 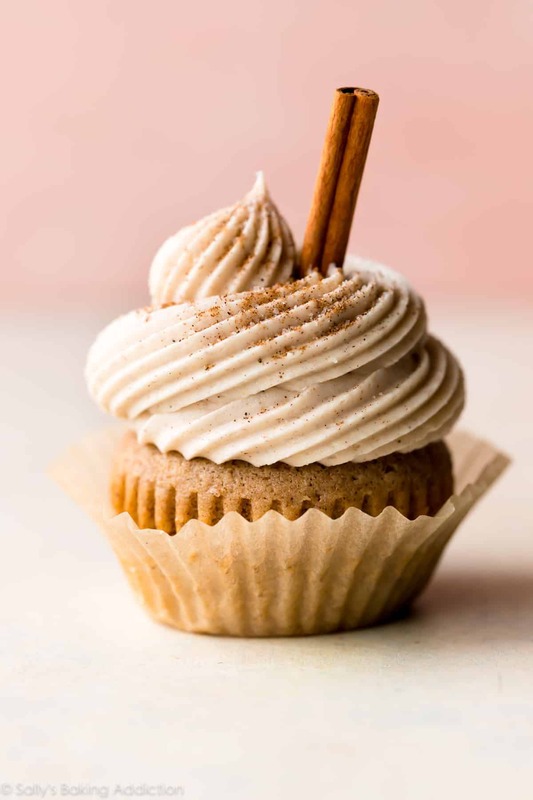 A cinnamon stick and a sprinkle of sugar/leftover chai spice mix adds a rustic chic garnish to our chai latte cupcakes. A dessert you can prepare ahead of time, these chai latte cupcakes are fall must-try whether that means a batch of seasonal cupcakes for your coworkers, a unique contribution to a fall bake-sale, an impressive ending to a Friday night dinner party, a football Sunday treat, or even if you just freakin’ love chai tea lattes like I do! Sip and savor, my friends. 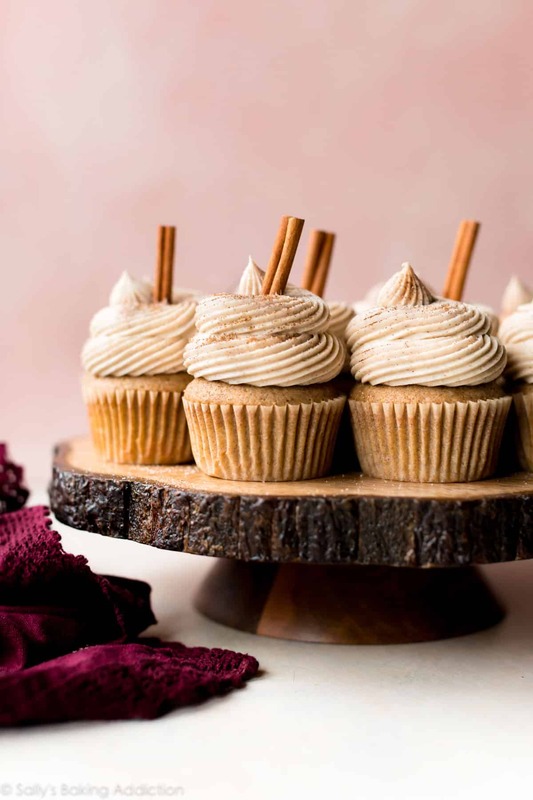 Soft and moist chai latte cupcakes prepared with chai tea, chai spices, and topped with whipped chai buttercream. This simple cupcake recipe tastes exactly like your favorite coffeehouse chai latte drink. Prepare chai spice mix: Mix all of the chai spices together. 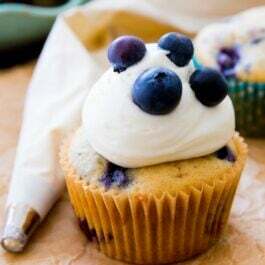 You’ll have 5 and 1/2 teaspoons to use between the cupcake batter, buttercream, and garnish. Steep the tea*: Bring milk to a boil or heat in the microwave for 1-2 minutes. Pour over tea bag and steep for 20-30 minutes. This chai milk is the milk you’ll use in the cupcake batter. This can be done the day before and refrigerated overnight. Make sure the chai milk is room temperature before adding to the cupcake batter. Preheat the oven to 350°F (177°C). 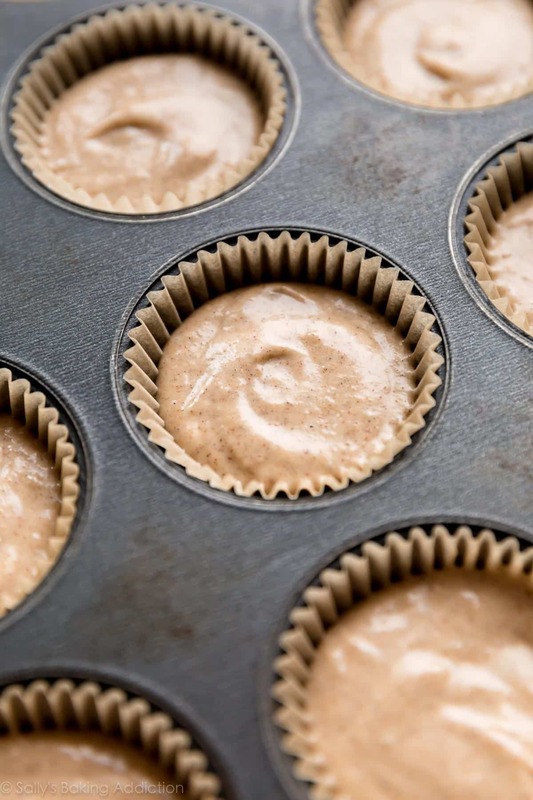 Line a 12-cup muffin pan with cupcake liners. Line a second pan with 2-3 liners – this recipe makes 14-15 cupcakes. Set aside. Make the cupcakes: Whisk the cake flour, 3 and 1/2 teaspoons of chai spice mix, the baking powder, baking soda, and salt together. Set aside. Using a handheld or stand mixer fitted with a whisk attachment, beat the butter and sugar together on high speed until smooth and creamed, about 2 minutes. Scrape down the sides and up the bottom of the bowl with a rubber spatula as needed. Beat in the egg whites on high speed until combined, about 2 minutes. Beat in the sour cream and vanilla extract. Scrape down the sides and up the bottom of the bowl as needed. With the mixer on low speed, add the dry ingredients until just incorporated. With the mixer still running on low, slowly pour and mix in the chai milk *just* until combined. Do not overmix. Batter will be slightly thick and smell incredible! Pour/spoon the batter into the liners. Fill only 2/3 full to avoid baking over the sides. Bake for 20-22 minutes, or until a toothpick inserted in the center comes out clean. For around 35 mini cupcakes, bake for about 11-13 minutes, same oven temperature. Allow the cupcakes to cool completely before frosting. Make the frosting: With a handheld or stand mixer fitted with a paddle attachment, beat the butter on medium speed until creamy, about 2 minutes. Add 5 and 1/2 cups confectioners’ sugar, the heavy cream, 1 and 3/4 teaspoons chai spice mix, vanilla extract, and a pinch of salt with the mixer running on low. Increase to high speed and beat for 2 minutes. Add up to 1/2 cup more confectioners’ sugar if frosting is too thin or another Tablespoon of cream if frosting is too thick. Add another pinch of salt if frosting is too sweet. Frost cooled cupcakes and serve. I used Wilton 8B piping tip, stuck a cinnamon stick in some of them, and sprinkled with a mix of the remaining chai spice mix and a pinch of granulated sugar. 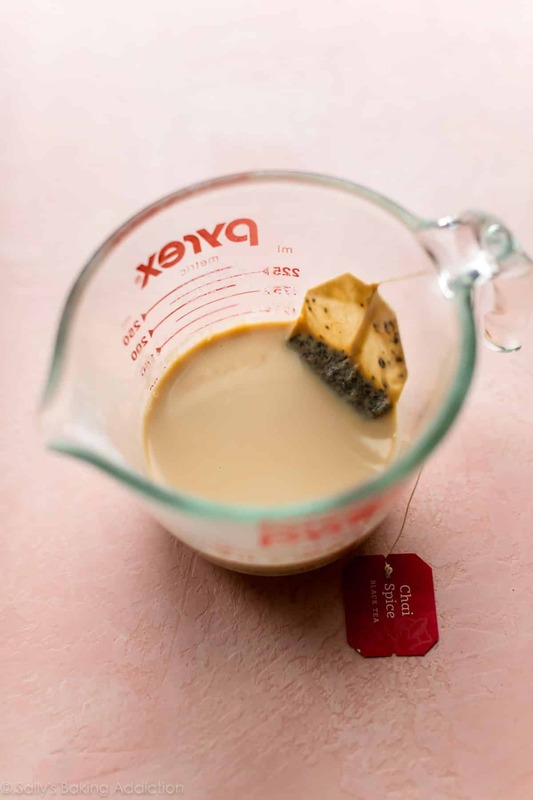 Make Ahead Instructions: An easy way to get a head start is to prepare the chai spice mix and steep the milk/tea 1 day ahead of time (steps 1 and 2). Cupcakes can be made ahead 1 day in advance, covered, and stored in the refrigerator. Frosting can also be made 1 day in advance, covered, and stored in the refrigerator until ready to use. Frosted or unfrosted cupcakes can be frozen up to 2-3 months. Thaw overnight in the refrigerator. Step 2: You’ll steep 1 bag of tea in 1/2 cup of hot milk to use in the cupcake batter. You could also steep a 2nd chai tea bag with the heavy cream to use in the buttercream, if desired! Make sure it’s hot when steeping, then cool to room temperature when adding to buttercream. Cake Version: I suggest following my vanilla layer cake recipe as the base, which is almost double this cupcake recipe. Use 2 tea bags for the milk since that recipe calls for 1 cup. 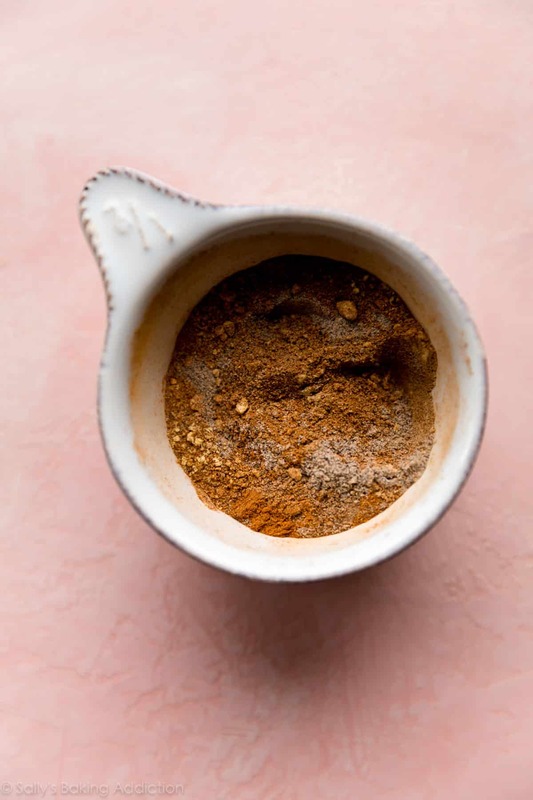 For the chai spice mix, increase the cinnamon to 2 and 3/4 teaspoons, ginger and cardamom to 1 and 1/2 teaspoons each, and the allspice to 3/4 teaspoon. You’ll have 6 and 1/2 teaspoons of chai spice mix. Use 4 and 1/2 teaspoons in the cake batter and 2 teaspoons in the vanilla frosting recipe listed with the cake.